Rhizo Sciences announces construction of 400,000 square foot export facility in Lesotho, Africa to meet growing international medical cannabis export demand. Rhizo Sciences LLC, a Seattle, Washington based medical cannabis company today announced plans to partner with Medi Kingdom Holdings (Pty) Ltd to build the $50M medical cannabis export facility in Lesotho, Africa. The cultivation and use of marijuana is rapidly rising across Africa as farmers, hit by low commodity prices, increasingly see the drug as a cash crop. Pressure for legalizing marijuana is increasing in many African countries as legalized pot in the U.S. and Uruguay leads the way. “At the moment, farmers choose to cultivate marijuana over traditional crops because it commands a far higher market price on the black market both at home and abroad,” Zambian Green Party President Peter Sinkamba told Anadolu Agency. 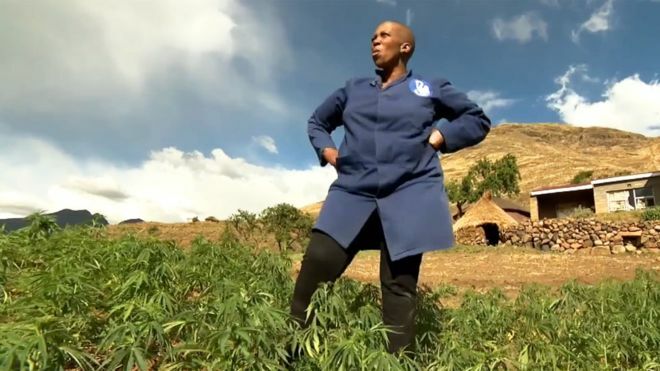 Marijuana gardens and a Lesotho lodge that doesn't exist. The gate was padlocked closed but there was no wall or fence so we drove in and parked in the yard of the no-name hotel.